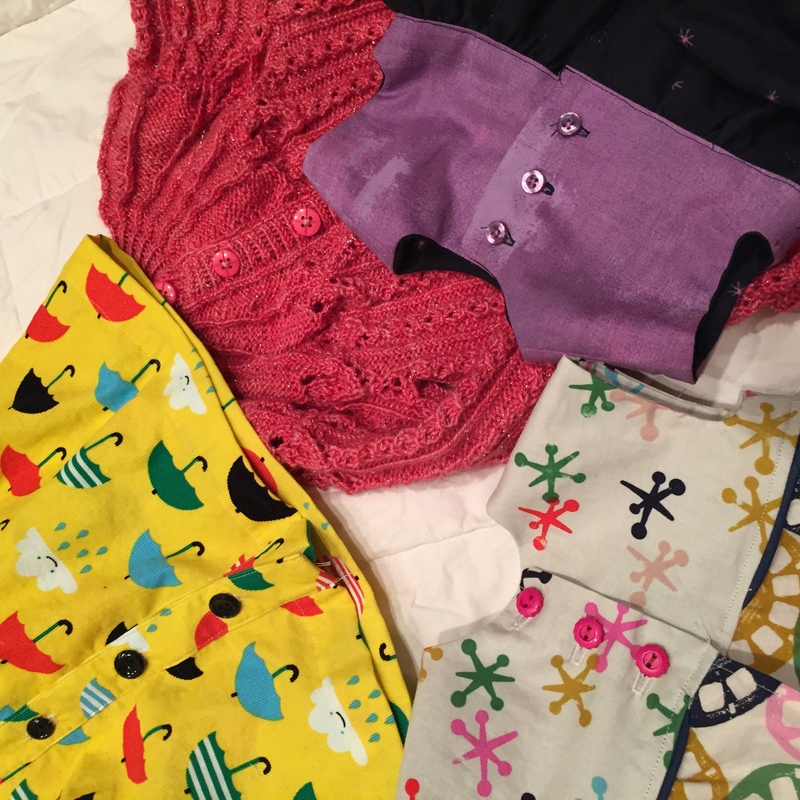 Sewcialists Tribute Month – The Project! Yay! I managed to fit in another project this month! I surprised the hell out of myself by knocking out one more thing this afternoon. To be fair it was more of an alteration, but I think it counts just the same. Last month I posted my plan for the Sewcialist‘s tribute month. To summarize, I’m paying tribute to Mrs. Mole from Fit for a Queen by altering a much too small skirt to fit my current figure. Like, the skirt was 7-8 inches too small in the waist. Whoops! Success!!!!! This turned out to be a really simple and fun project. First I took the old waist band off very very carefully as the silk is so thin the seam ripper could easily slice right through. Then I folded the skirt in quarters and turned to my trusted copy of Patternmaking for Fashion Design to find out the waist radius for my current waist size. A quick snip to enlarge the waist and I was on my way. The next step was to insert a side zipper. The original dress had a front waistband that wrapped around the back and hooked, then a separate back waistband wrapped to the front and tied. There were 5 inch openings on each side to allowed room to pull the skirt on. I closed one of the side openings and enlarged the other to make room for a zipper. I used an invisible zip because that’s what I had on had, but a lapped zipper also would have worked well. I discarded the original front waistband that hooked because it was too short to reuse and stabilized with a material that would have been hard to find today. The back waistband/tie was gloriously long! 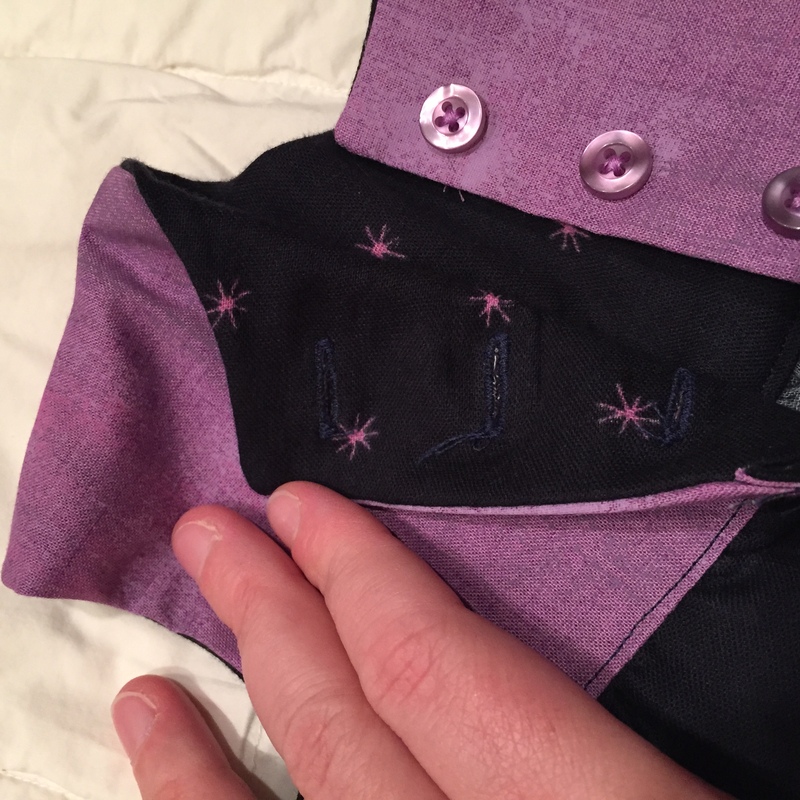 I picked up some purple silk organza at The Fabric Store (the same outing as my previous LACMA excursion) and inserted a double wide length into the new waistband to stabilize the original silk. Lucky me, the silk pressed like a dream and the original 60 year old creases made sewing the new waistband to the skirt very very easy. It was shocking how nicely those creases agreed with the alteration process. I hand stitched the waistband down on the inside and now all the raw edges are completely inclosed. The only problem is figuring out where I can wear a hand-painted Mexican silk skirt with piggy banks. Church? Date night? Work? Back to School Night? It is totally fabulous and feels wonderful in this summer heat, but it is a lot of look if you know what I mean. And should I stick with the white blouse? I’m kind of tempted to whip up something in hot pink or teal instead. A simple Cashmerette Springfield might work without overwhelming the beauty of the skirt. Anyone want to throw out an opinion? In the meantime I’ll keep playing dress up and spinning around my yard. 2016 has come and gone. Last night we had storms passing through, but today has arrived cool, clear, and with a beautiful bright blue sky. Like many others 2016 was not my favorite year. Beyond the political landscape, it was just an okay year for our little family. We got by fine, the kids grew and thrived, but it wasn’t an easy year. By the end of it I felt quite worn down by the routine but also by the instability. There was a lot of good stuff coming out of our house as well. I spent a lot of time on my sewing skills. I now have a much loved skater-style dress I make and wear frequently. I also discovered I do better when I work off the Gertie block then the Cashmerette block (for wovens). I’m sure in the coming year I will buy more patterns, but I also hope to make my own block again. I have a lot of ideas of dresses I’d like to make, but I think making my own block would really help me spend less time fitting and more time designing. I made some misses too. A few poor fabric choices and a few patterns that just didn’t work for my shape. And sometimes things turn out okay, but they fail to make it to the regular rotation. I think you’d be hard pressed to find a sewer who doesn’t have a few flops every year. And then there are my sweet girls! Not as much sewing for them as with previous years. Mostly because Charlie can wear so many things I made for her sister and she’s stayed quite tiny. Partly because Lu finally grew enough that she can wear commercially produced school uniforms! I ordered a select number of skirts and dresses in August and Lu’s been set for school since. I am incredibly proud of their swimsuits and plan to make them new suits for next summer. So much fun and really simple. What’s next? I still have some quilts to finish. One for my bed and the girls matching quilts for their room. We moved all the baby stuff out over the winter break and we’re contemplating bunk beds this summer, so I’d like to get those quilts done. Otherwise I’ll just keep looking for new inspiration. I organized my fabric stash a bit this week and remembered I have fabric to make the Sewaholic Pacific Leggings, my SIL bought me the Decades of Style Lara Dress pattern, and I have more wool jersey to make a skater style dress. Maybe I’ll get to those things, but if I don’t it is okay. I can’t wait to see where 2017 takes me! My love affair with separates continues! And mostly it is thanks to the patterns from Sewaholic! Having skirt patterns pre-drafted to a pear shape is making my life so much easier! I have many pretty blouse patterns I’ve never made because finding commercially made skirts is so frustrating! I’ve tried making skirts too, but the all too often looked homemade. This is the year I change that trend. This is the Gabriola skirt. You might not recognize it because the pattern is for a maxi length skirt and its supposed to be made with a drapey fabric. But I like to make things my own, so I hacked a ton of length off the bottom and made it in denim. Rules? What rules? And because my goal is to make my skirts appear less homemade I put in an exposed metal zipper. It is not my best zipper installation of all time, but it looks pretty good. Then I top stitched every single seam. And I love the lines of the skirt! It reminds me so much of those 1920s and 1930s bias cut dresses! Here is where you can see the combination of denim and this front point isn’t perfect. But whatever. Most women seem to think leggings are appropriate to wear out on public, so I’ll forgive a few oddly draping spots in my skirts. Still way way way better than anything I’ve seen in a store in many many years. And I’ve wanted a jean skirt for quite a while. Summer at my job is very very casual and heck even during the year a dark denim skirt wouldn’t be out of place. So I picked up this fabric at JoAnn’s on sale figuring I could use it for another Hollyburn skirt. But recently I’ve really enjoyed wearing skirts that fit closer through the hip. It seems more flattering to my shape. That’s when I decided to go for the Gabriola instead. The blouse is also new! It is Jennifer Lauren’s Afternoon Blouse and another lovely nod to retro shapes. 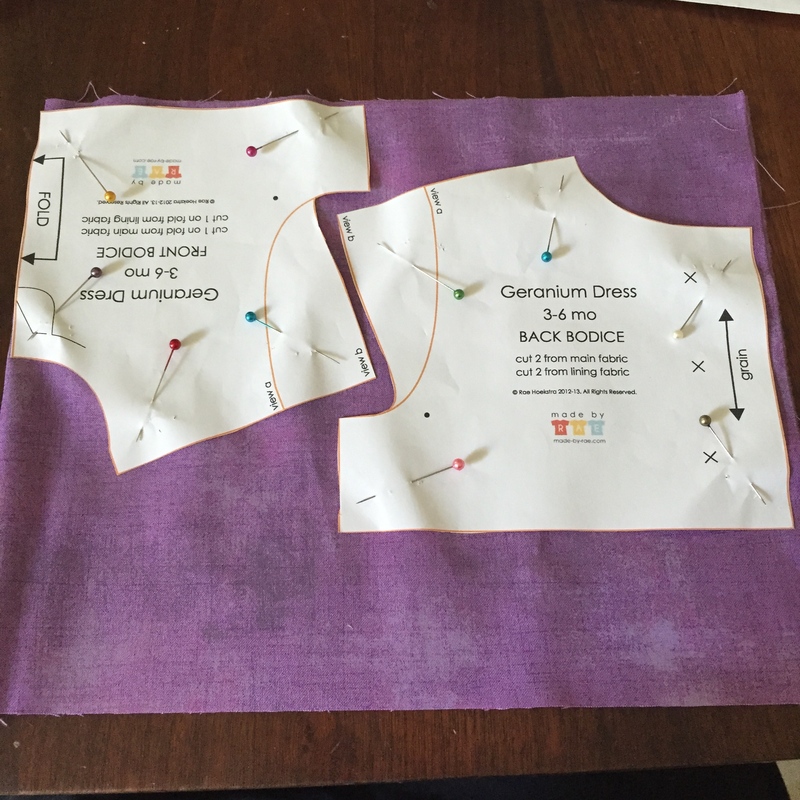 The hardest part of this pattern is taping all the pieces together! Sigh, I love a printed pattern so much more than a pdf, but this pattern kept calling to me, so I took the plunge. So glad I did. Jennifer currently drafts her patterns for a D cup, so I cut a straight size 18 and it worked perfectly. Plenty of room in the cut on sleeves (so rare for me) and I’m happy with the fit for a casual summer blouse. The fabric is from the collection London Calling from Robert Kaufman. I’m pretty sure I bought it to make the girls something, but too bad. Mine now. I’m tempted to make the dress version, but I can’t decide if it will just end up looking like a tent. I’d say I should try it for a weekend dress, but I have plenty of those already. I think I’ll ponder a little longer. Really I like both of these pieces a lot and I know they will get plenty of use once our weather warms again (its only in the high 60s right now). I have some striped chambray set aside for another skirt and some Liberty of London yardage for another blouse. I’ll get to them eventually. And hey! The outfit even gets a thumbs up from Charlie! Once upon a time before I had two beautiful girls I would wear 1950s inspired dresses all the time. The fit and flare silhouette really suits my pear shape figure and so it was pretty easy to make dresses in that style and have them turn out well every time! Who doesn’t love a good swishy skirt? Lately I’ve felt the desire to return to my sewing roots and give the mid-century retro look another try. Dresses and skirts from the 1930s to the early 1960s are fantastic and feminine and everything I love in clothes. So today I’m here to share a new version of the Sewaholic Hollyburn Skirt. It’s a favorite of sewing bloggers and I can see why! In fact I saw a vintage pattern that looked exactly like this pattern somewhere on the internet this week, but of course no I can’t think where. The fact that is it drafted for a pear shape is even better. Edit: YES! I figured it out. I saw it on Tanya’s Instagram feed! It looks exactly like Marian Martin pattern 9488. I was only able to find one blog post with a good write up of the pattern. Looking at the pattern pieces, this is nearly identical to the Hollyburn. This version is a straight forward version B with the tabs at the waist and a knee length in a size 16. No alterations at all. I made a couple of these last summer too, but in the shorter length and I don’t like them as much. The longer length suits my life a little better. YAY! No sway back adjustment needed! The fabric is the only fabric I buy at JoAnn’s on a regular basis. It’s their Linen Look in navy. A cotton and rayon blend that wrinkles like crazy, but it easy to work with and particularly easy to wear in our hot hot summers. Plus it is almost always on sale. Added bonus, the skirt looks perfect with my t-shirt from Mischief Made Me! * I’ve wanted to wear this shirt ever since I received it, but had no bottoms that coordinated. So happy to be able to wear my mermaids now that the weather is warm! Now for your bonus mommy daughter matching outfit pictures including this week’s dance pose with Lu. I also bought yardage of 7oz 100% cotton dark denim. Trying to decide if I should do another Hollyburn or something different. Sound off if you have an opinion! * I’m related to the owner of Mischief Made Me so she graciously gifted me this shirt. I love it though and would have happily bought it myself if she’d accept my money. This is an XL size and my bust is about 42 inches. Matching kids shirt is here. I’m not going to lie. I’m pretty darn pleased with myself over this one. Yesterday when I picked Lu up from school I noticed a sign saying today would be dinosaur day at preschool and kids should wear anything dinosaur themed to school. Problem was Lu didn’t have any dinosaur clothing…yet. I just happened to have a yard of dinosaur fabric from Natural History by Lizzy House. I’d picked it up after Lu started taking a big interest in dinosaurs about a month ago. And I’d planned to make a skirt, but hadn’t gotten to it yet. In fact I’d planned to do something a little fancier than this, but I had one night. Simplicity wins. I did not use a pattern. Elastic waisted toddler skirts are not terrible complicated, but maybe someday soon I’ll do a tutorial if there is interest. And I fussy cut two pockets for the front, because a girl needs a place to hold her dinosaur friends. Hope you have fun at school today! It’s been a little quiet around here. Sorry! I’ve been working on a couple gifts that I can’t post about until they are given. Those have been in the big projects. But I’ve been busy with a few little projects too. Mostly making clothes for Lu to wear this summer. Her school usually requires navy and red uniforms, but summer they have free dress. Yay! The only problem is that Lu has decided she only likes to wear skirts and with her little 19 inch waist almost all commercially made skirts fall right off of her. And yes, I could have just altered the waists on purchased skirts, but making them is more fun and super easy. For instance this little elastic waisted skirt featuring Ann Kelle’s Super Kids fabric. Such a simple skirt to make. I just cut a big rectangle, added a casing for the elastic, and hemmed it. A project that takes less than an hour from start to finish but makes the most of a larger scale print. There is also this little skirt made with Heather Ross Briar Rose Fabric. This is fabric Lu picked out when we went to The Intrepid Thread last February. 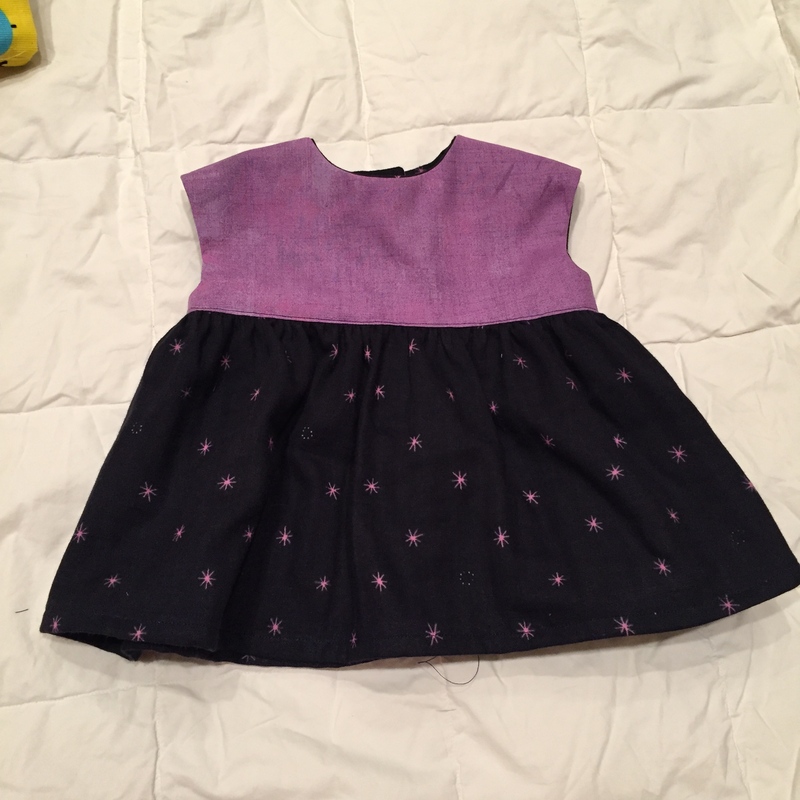 To make this one I traced her favorite Hanna Anderson skirt for the shape and length. Then I added a ruffle to the bottom and an elastic waist band. I was cursing myself for adding the ruffle because it sucked up a lot of time, but the end result is so cute that I’m glad I stuck with adding the fun detail. Then there is the skirt Lu and I designed together using Cotton + Steel’s Palm Springs lawn. This was a fun skirt to put together. I had a piece just 26 inches long and spent a couple of months trying to decide how to use the fun pink border that runs along one selvage of the fabric. It wasn’t quite long enough to be on the hem of a dress or skirt. So one night Lu and I studied the fabric and we decided to put the flower on a pocket. Yes! a pink pocket. Lu was pleased. And I had just enough length left to make a pink waistband too. This one is fun because it is also fully lined with the blue flowers. And the last to share today is not actually a skirt, but a skort! Skorts are the best. Looks like a skirt, but with shorts built in for modesty while playing. 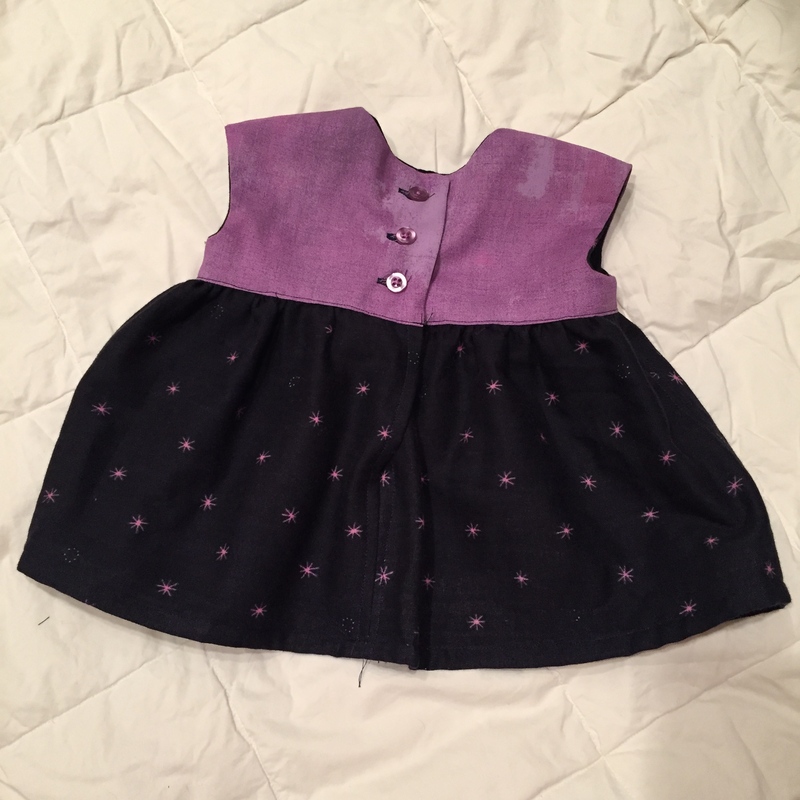 The fabric came from a Girl Charlee KnitFix. I decided to try it out one month and was disappointed in the prints and quality overall. But someone traded with me so I could have this daisy print which worked perfectly for this project. Originally I’d thought to make a dress with it, but then I took a trip to JoAnn’s and found McCall’s patterns on sale 5 for $7. So I took a look through their catalog and found that their children’s patterns start at size 3. Perfect! M6918 is such a versitile pattern. 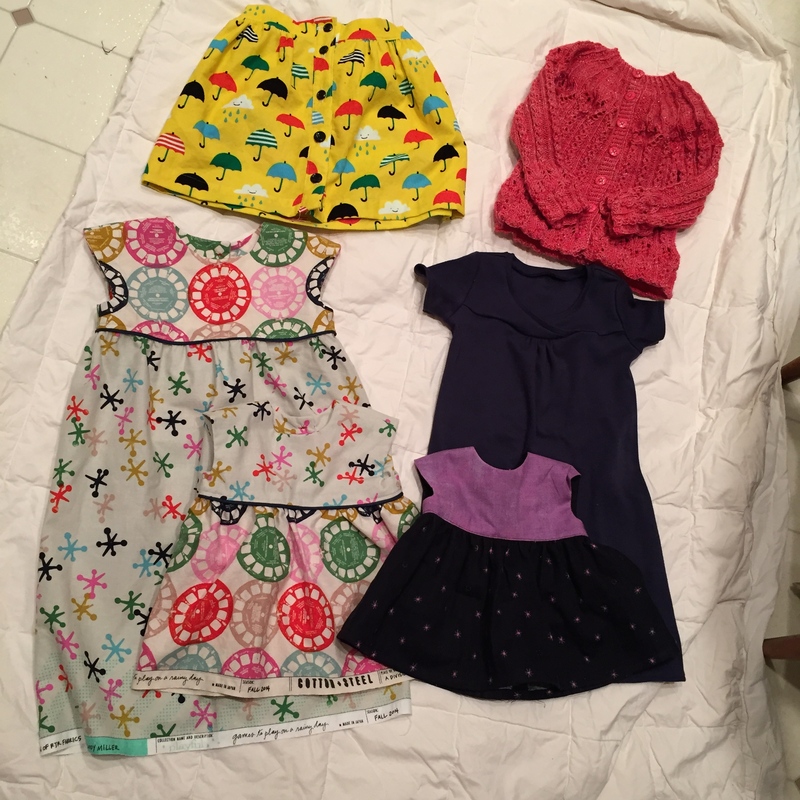 4 different skirt shapes and the option for shorts or capris underneath. I will get a lot of use out of this pattern. All I had to modify was the length of elastic in the waist! Whew! So that makes 4 skirts for this summer, but that won’t be enough! More to come once I have them put together. But probably not for a couple of weeks as my machine is due for a little maintenance. In the meantime I’ll be knitting and update you on a couple of other projects I’ve been working on.